Warning: Anything I discuss (be it books, movies, tv shows, etc.) may or may not contain spoilers and I may or may not mention the potential spoilers before/during a post. 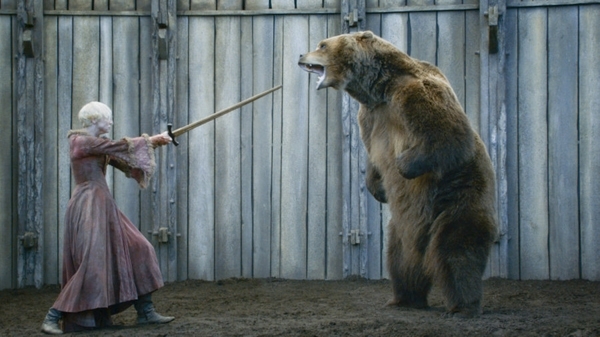 This seems to be the running screenshot used for discussing "The Bear and the Maiden Fair" episode of Game of Thrones (aired 05/12/13). I have read all of the published books in the A Song of Ice and Fire series, and LE made a comment as we watched GoT that got me thinking about book snobbery - which I admittedly take part in. It's a rare occasion that I see "the movie" before reading "the book" (picture those as air-quotes) - and yes, I'm prone to outbursts of "the book was better" (not counting you, American Psycho). So, I will watch Game of Thrones and contemplate the changes in story or character, understanding some of the reasonings behind the changes from canon, other times scratching my head, and other other times not even realizing there was a change at all until reading about it later on WinterisComing.net or the like. But for the most part, I am willing to drop the "book purist" mode and allow things to flow. I'll give you your warning this time: if you haven't read the books, SPOILER. The Robb/Talisa scene comes on and we all watch as the couple continues to fall deeper and deeper into their doomed love, and now with news of a wolf pup on the way we get fed sensations of love and pride and anticipation (separate storyline, but what was it The Boy said to Theon?.. "if you think this has a happy ending, you haven't been paying attention"). LE looks over at me, blank, "it's hard to care knowing it won't matter soon." (that's likely paraphrased more than quoted - as a reader/writer you'd think I'd remember dialogue better, but I was also watching the show and unless I really dislike something, I am prone to tune the rest of the world out). But she means more than "care" here. It's hard to even pay attention. Who cares about his discussions, battle plans, love life, family matters, etc. when the Red Wedding is at most three episodes away? Let's get Arya's storyline moving! Which takes us to the point of this post; maybe it would have been better to not have read the books first (in this case). Part of me envies the "non-book reader" reviewers out there that are living in the moment of the show, trying to piece together how it will all work out (I look forward more to reading as they try to decipher the complex puzzle GRRM has laid out - vicariously living through that blank slate view of the GoT world, than I do the other reviewes of those who also know what's coming). Not having read the book, how much more surprising would it have been to see Sean Bean's head taken off at the end of Season 1?.. 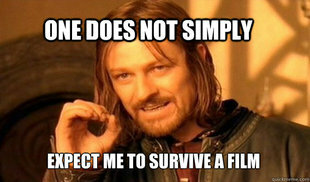 Ok, Sean Bean dying is a bad example. I suppose in the end it is a matter of preference. One way or another you will be spoiled. So, which is worse, reading first and knowing how things are "supposed to" go or watching first and having character images, plot, etc. potentially spoiled and then having additional details filled in with the reading (I mean, the show just doesn't give me the details I need about Tywin Lannister's breakfast choices)? I will fess up and admit that I watched Season 1 before reading the book (that'll be 50 DKP minus, for me), and in the end I was not concerned about having the character images ingrained in me as Sean Bean, Peter Dinklage, etc. etc. 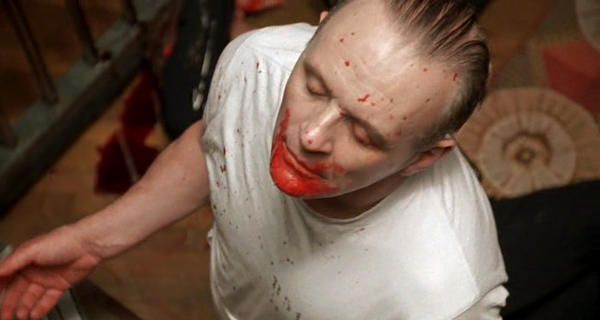 because the show did (and continues to do) a fantastic job in the casting department (I also watched Silence of the Lambs before reading it, and why would I want to picture Hannibal Lecter as anyone but Anthony Hopkins?). But there's some form of dork power in reading the book first - in knowing that in front of Cersei is a creamy chestnut soup, crusty hot bread, and greens dressed with apples and pine nuts - bickering over the show's use of Gendry instead of Edric Storm - QQing over the omission of Renly's peaches. My personal preference will likely always remain that I'd rather read the book first, and in doing so I accept that the show is manipulating me in adding more details of Robb and Talisa's relationship so I care more about him before "The Rains of Castamere" is playing at Edmure's wedding. I'll admit a certain lack of caring about storylines in knowing the outcome, but revel in seeing something I enjoyed reading so much transformed in a new (and let's face it, more mainstream) medium. What I liked: I am a sucker for witty dialogue and Tywin stole the show belittling Joffrey.